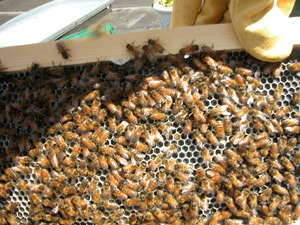 On the left, cropped out of the photo top right, is what looks like a laying queen. She has very faint stripes, a longer abdomen, and that puppy appears to be stuck down in some comb in the act of laying. 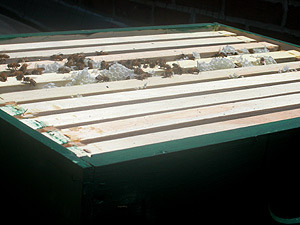 In the middle, an open Colony 2. 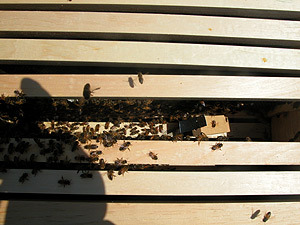 See all the brace comb? 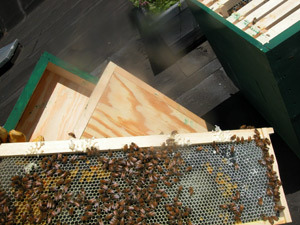 On the right, a close up of a Colony 2 frame: you see a worker bee tending honest-to-goodness larva near the top. The little white dots in the other cups are eggs. The yellow stuff is stored pollen. This is a frame from Colony 2. I think it looks good. 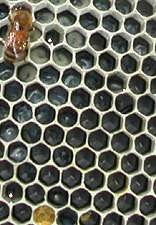 comb has been drawn all over it, and you can see an arc of yellow pollen stores around the egg laying area. This is what we want. 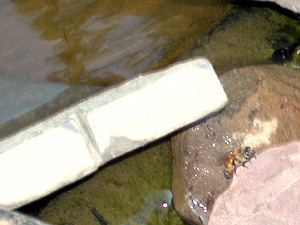 On the right, one of the signs of life around here has been bee traffic to the water feature in our garden. We put rocks for them to drink from, so they won't drown. They actually load up on the H2O and carry it to the roof.